This spring saw a new American Viticultural Area (AVA) burst onto the scene. Steve DeBaker, owner of Trout Springs Winery, spent years working on getting the Wisconsin Ledge designation passed. Palate Press asked him to tell the story of how the process took place and what it means for wineries in the area. Little did I know, seven years ago, in 2005, when I sat down to prepare the petition to establish the new Wisconsin Ledge AVA for northeast Wisconsin, that I would end up with a 200-page document, over 100 exhibits, and just over 2500 hours of invested time. Making wine teaches you to be patient, but even the hardest wine to make does not take seven years. Having gone through this process, however, has given me a greater appreciation for those that have gone before me, and those who have assisted me through this arduous task. Establishing this appellation of origin will not only put a stamp of legitimacy on our region, but it will also forge the way for future vineyards and wineries to brand their wines the same way that other regions like the Finger Lakes, the Sonoma valley, and the Beamsville Bench have done. This will not just be a place to visit, but a destination spot to explore the unique qualities that the Wisconsin Ledge has to offer. Based up on the geomorphic land mass called the Niagara Escarpment, this area known as the Wisconsin Ledge boasts a 3 to 4 week longer growing season based upon a 7- to 20-degrees cumulative warmer spring and fall. Soil, elevation and marine influence all play important factors along with the limestone-base terroir in which these grapes develop their own character. There are presently 15 bonded wineries, and several hundred acres of vineyards now planted within the Wisconsin Ledge, with plans for more wineries and vineyards to be started in this coming season. The Wisconsin Ledge becomes the 203rd AVA in the U.S., with the area being the 12th largest in the US. Wisconsin also ranks 16th in the nation in the number of wineries per state. 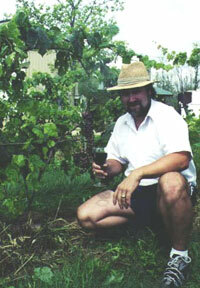 DeBaker grows vinifiera varieties such as pinot gris and cabernet franc along with French-American, New York, and Minnesota hybrid varieties. This effort could not have been made without the help of Eric Fowle, director of NERN (Niagara Escarpment Resource Network), or the help of his staff at the East Central Regional Planning Commission. Their diligence in providing the correct mapping of the area and expertise in editing and crafting the petition for review by the TTB was an asset that could not be replaced. The knowledge and past studies of the Niagara Escarpment and its flora and fauna by Eric and his team helped establish critical information needed to promote the petition, and convince the TTB to accept my reasoning for the establishment of the Wisconsin Ledge. I can only compare this experience to what I would imagine it would be like to give birth to a child. The nine-month process (i.e. seven years!) constantly changing and re writing and researching documents, mental pain and anguish; feeling periods of happiness when short positive steps were taken, feeling defeated when sections of the petition were rejected for rework, then finally a feeling of elation when you have given birth and counted all of the fingers and toes and all is in place. This is the feeling that I got when I received the confirmation that the Wisconsin Ledge would be a reality. My vision for this AVA and the emerging industry has been realized, and I can only envision that, twenty years from now, the number of people taking advantage of this opportunity will have quadrupled,and that we can look back at this time with a degree of pride and accomplishment! By making these wise land-use decisions, utilizing sustainable farming practices, we will not only preserve, but enhance and compliment the beauty of this special place we call the Wisconsin Ledge. This is great information, but how do we find out about actual vineyards in this region, what types of grapes they produce, and how much they yield each year? While it is easy to find information on wineries in this region, most of them do not use actual Wisconsin grapes for the wine they produce.